Thanksgiving is here before you know it. I don’t know about you, but holidays are my favorite times to try out new recipes and surprise my family and friends. This year is no exception. I’ve spent hours looking though food magazines and thinking of the new food creations that I’m going to make for Thanksgiving. If you are like me and love experimenting with food, here’s my holiday tip. When writing down your Thanksgiving menu, put staple dishes, like Roasted Turkey, Green Beans Casserole, Mashed Potatoes, and also include new, easy to prepare dishes to wow your guests. 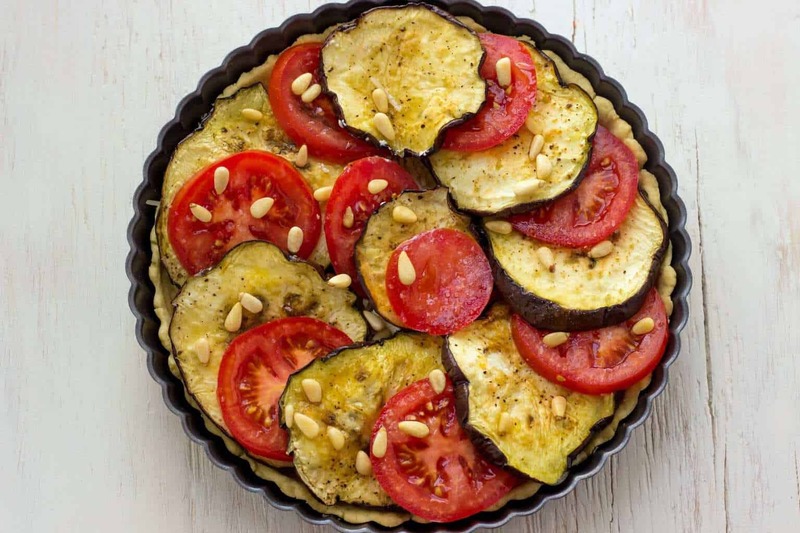 Hint: my Eggplant Tart With Tomatoes And Goat Cheese will do the job. It’s perfectly moist, cheesy, flavorful and extremely delicious. Sounds like a deal? Then, head over to a grocery store to stock up on the ingredients. First, you would want to buy a really fresh and ripe eggplants and tomatoes. 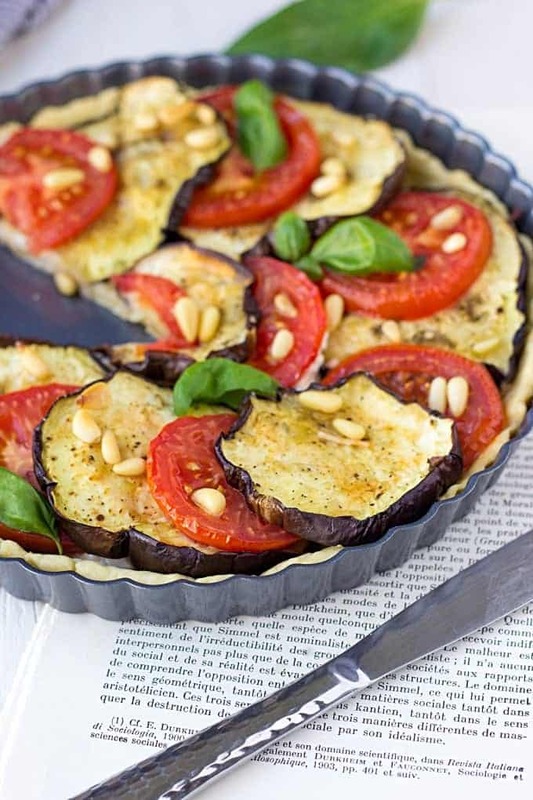 This is a vegetable tart, so you want to make sure your fresh produce is of the best quality. Next, you need a good high-quality flour. I recommend Bob’s Red Mill. This is the same high protein flour used by professional bakers. It produces high, well-textured loaves of bread as well as light and airy baked goods. This kitchen staple is incredibly versatile and perfect for all of your baking needs. Now, that you’ve got ingredients on hands, let’s start cooking. Start off with making the pastry. 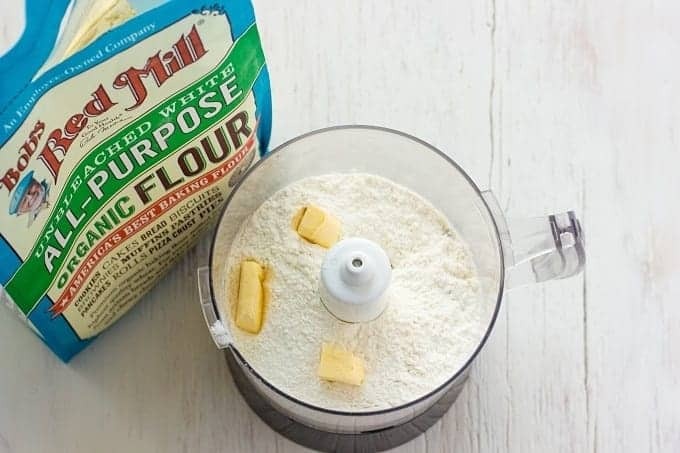 In a bowl of standing mixer, combine butter, flour and salt, and process until the mixture resembles coarse crumbs, about 10 seconds. While mixer is still running add water and pulse for 5-6 times until soft dough starts to form and pulls away from the sides of the bowl. 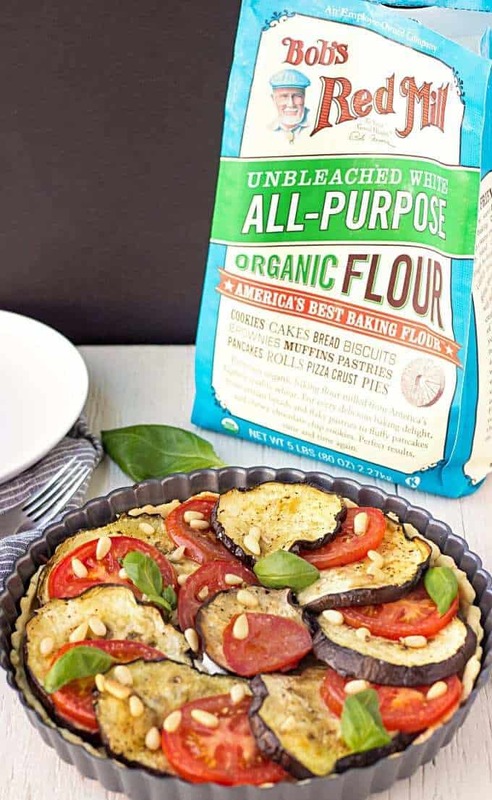 On a lightly floured surface, roll out the dough to an 11-inch circle and press it into 9-inch tart pan with a removable bottom. Refrigerate for 30 minutes. Cut a middle portion of eggplants and cut crosswise into 1/4-inch-thick slices. 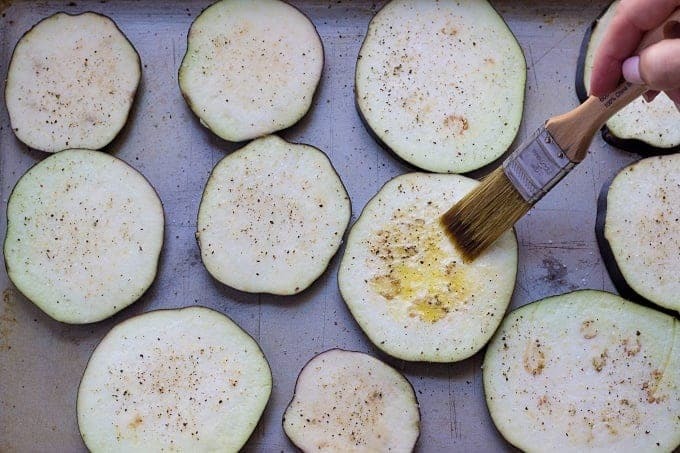 Place eggplant slices on a parchment lined baking pan, sprinkle with salt and pepper and brush both sides with olive oil. Bake eggplant in a preheated oven for 15-20 minutes. Line the pastry with parchment paper and fill with pie weights. I usually use dried beans. 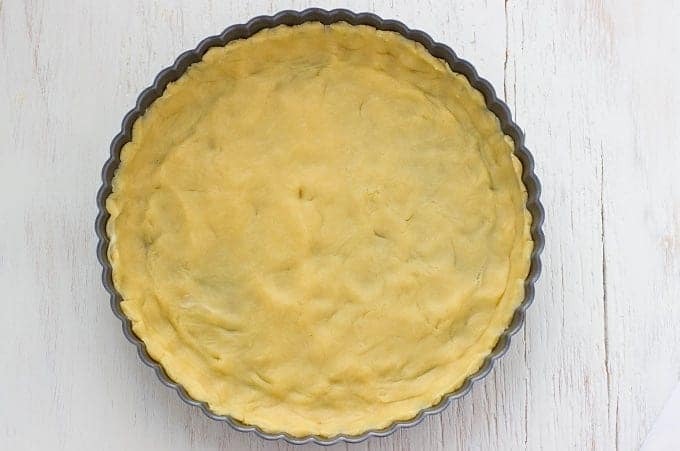 Prebake the crust until golden brown, for 8 to 10 minutes. Sprinkle the bottom of the prebaked crust with grated Parmesan cheese and evenly scatter goat cheese over the tart. Layer eggplant slices interchanging with tomato slices. Season with salt and pepper and drizzle with olive oil. Bake in the preheated oven for 20-25 minutes until tomatoes appear soft. 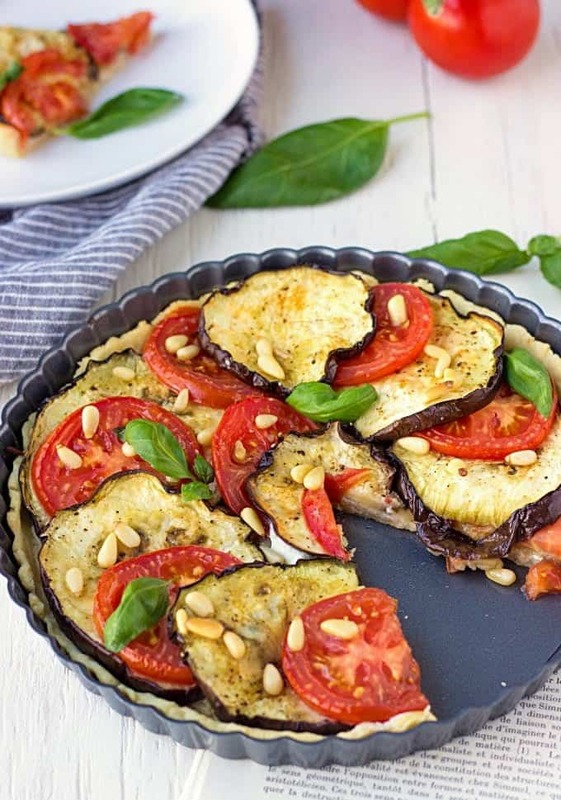 This Eggplant Tart tastes better when warm. So make sure to warm it up a little just before serving. In a bowl of standing mixer, add shortcrust ingredients and process until the mixture resembles coarse crumbs, about 10 seconds. While mixer is still running add water and pulse for 5-6 times until soft dough starts to form and pulls away from the sides of the bowl. Bake eggplant in a preheated oven for 15-20 minutes. Remove from the oven and set aside. 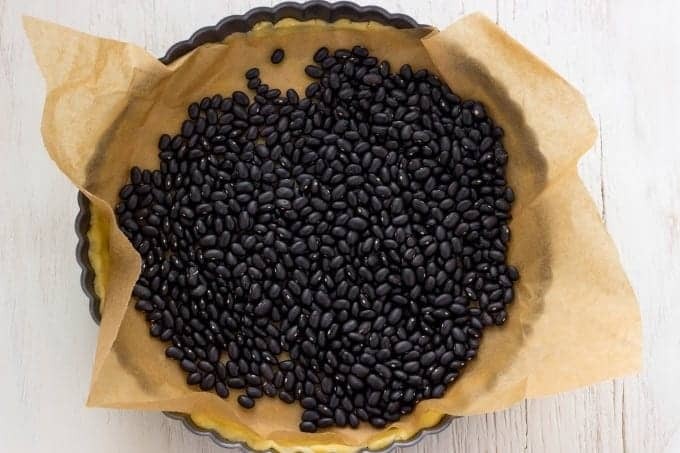 Remove pastry from refrigerator, line it with parchment paper and fill with pie wights (dried beans will do). 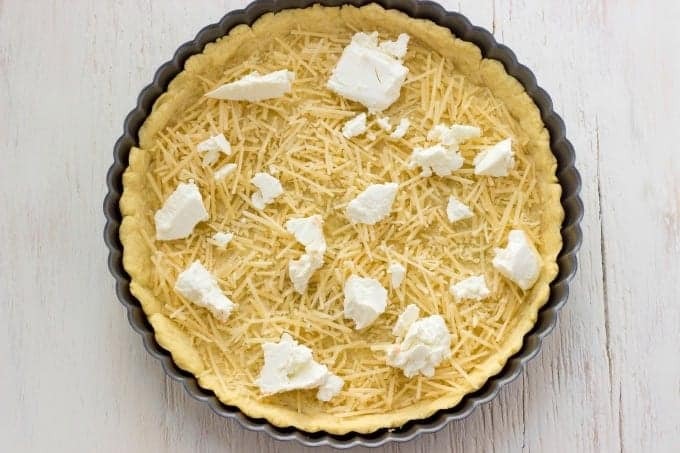 Sprinkle the bottom of the prebaked crust with grated Parmesan cheese and evenly scatter goat cheese over the tart. Layer eggplant slices interchanging with tomato slices. Season with salt and pepper, drizzle with olive oil and sprinkle with pine nuts. Bake in the preheated oven for 20-25 minutes until tomatoes appear soft. Garnish with basil leaves and serve warm! how do you pulse in a standing mixer? the photo shows a food processor, not a standing mixer, but your directions say standing mixer. please clarify. Billy, sorry for the confusion! Yes, I meant to pulse in a food processor.